How is this haggada different from all other haggadas? This innovative haggada turns you into a master story teller. Rather than placing commentary below the text, The Art of Amazement Haggada embeds the midrashic details into the text. 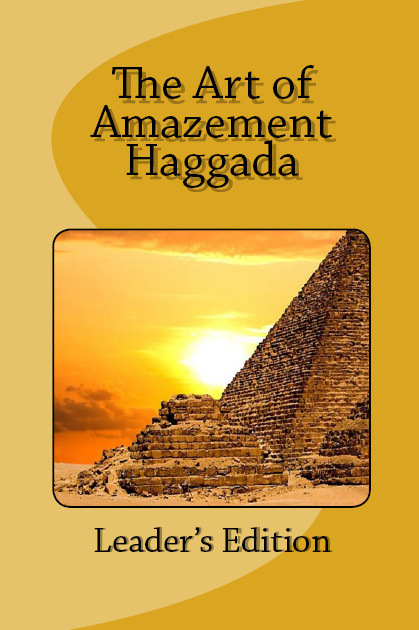 “Haggada” means “telling the story” and this haggada will empower you with the mastery of Midrash to keep your participants glued to their seats. Revised and updated in 2017. Want to preview before you buy? No problem: here’s the free Haggada Sneak Preview . • Almost everything is transliterated and translated. Very little Hebrew. • Midrashim and questions are embedded in the text so instead of looking down at footnotes or at a different notebook or book, it’s all there for you. • 12 Tips on how to prepare for and run a successful, engaging Seder. Designed and cross-referenced to be used with the participant “Freedom” edition, but will go well with any other haggados. 3. Leader’s Edition — Download PDF and print yourself. Support JSL and get the Haggada for free! Please use the DONATE button to contribute $10 or more. You do not need a Paypal account. We will then send you the download link as a thank you for your support. Organizations – looking for a branded Haggada for your Passover programming?